Jonathan Hickman and the Avenger’s writing and editorial team are turning linewide crossovers into highly choreographed dance before our very eyes. From the relatively staid Infinity #1 sprang Hickman’s own Avengers #18 and New Avengers #9 – one a space battle that forged unlikely allies, the other a civil war between Earth’s remaining mighty heroes. From Avengers #18 spun Kellie Sue DeConnick’s two-sided coin of Avengers Assemble #18 and Captain Marvel #15, following two Avengers Quinjets into and out of the battle through the eyes of two best friends separated by the gulf of space. They were four highly enjoyable comic books. The coordination between Avengers, Assemble, and Captain Marvel was nothing less than extraordinary – each one mirrors scenes from the other to construct a prismatic view of the same battle. That brings us to the second entry in the main event – Infinity #2. Would it play out yet another dimension of the same space battle? Would it breathe some life into the characters from the prior issue? Would the teenage angst of the art improve? Script and graphic design by Jonathan Hickman. Art by Jerome Opena & Dustin Weaver. Color art by Justin Ponsor. #140char review: Infinity #2: The plot picks up as a still impersonal story snaps between Earth & space but it’s Opena’s portion of art that makes this epic. Infinity #2 is a thriller from its opening pages, and writer Jonathan Hickman can’t even take all the credit. Marvel needs to back up a Brinks truck to the front door of Eisner-winning artist Jerome Opena to ensure his participation on big event books for many years to come. Surely his highly-detailed, cinematic art takes a steady hand and long hours to produce, but every damn frame of it in this comic book is utterly gorgeous – especially wall-worthy recaps of the battles shown in New Avengers. Justin Ponsor’s colors ground Opena’s lined work, adding to its depth and texture. I suspect this is the sort of comic art movie-goers are hoping to find when they crack open an issue or buy it digitally. Marvel can’t afford to have this sort of weary realism grace the pages of every book – nor would that be appropriate. But it’s a welcome delight after events handled by the slick, animated style of Coipel and Immonen. 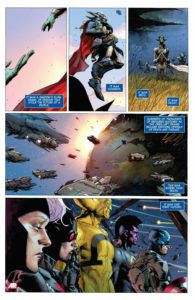 When it comes to The Avengers and massive events, readers deserve the best of that style – and right now Opena is its pinnacle at Marvel (along with veteran Mike Deodato on Hickman’s Avengers books). Not all of the book is Opena – after a low-orbit prologue, he sticks to the space battles, leaving two scenes of Earth-bound action to compatriot Dustin Weaver. Weaver, whose notable slowness has marooned a second series of Hickman’s SHIELD two-thirds of the way through, is in solid form in his two segments if not a match for Opena. As with Cheung before him, he draws terrific architecture and monstrous aliens. However, he also nails all of the human figure-work and faces – at least, for the men he does. He can’t seemed to decide how to draw Inhuman queen Medusa from panel to panel. Overall, the art is just a mugging Inhumans away from five-stars, but how does the story fare? Hickman is in finer form here than in the first chapter, deftly playing between the scenes of the four tie-in issues that intervened. 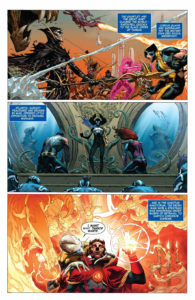 A brief prologue showing an armed infiltration of a S.W.O.R.D. satellite base is isn’t strictly necessary, but wisely frames the action on Earth that we saw in New Avengers #9 to draw it into the context of this story. Opena’s panel’s of Sydren are perhaps the best he’s ever looked (and I think I own his every appearance so far). Similarly, Hickman and Opena dispatch of the three-issue space battle in a single page that expertly weaves in the action we’ve missed. 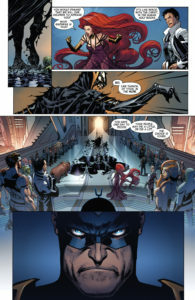 Scenes in the Inhumans’ floating city shows why Thanos’s interest have suddenly turned to Earth while The Builders’ obliterate societies across the galaxy, while in the intervening pages we see The Builders’ plot of destruction is not as one-sided as we thought. In getting there, we view a series of thrilling still-frames from a kinetic space battle that casts our Avengers (and Claremont-created Gladiator of the Shi’ar) as a new pantheon of powerful gods to replace our creators of old. What use does an adult society have with its progenitors? Once we are given life, how long must we show gratitude and deference before striking our own path? The Builders seem to be contemplating these same questions, as they send a sole Ex Nihilo (meaning “out of nothing” – a concept intrinsically linked with creation) on a mission that runs counter to his life’s purpose. This is the Hickman I know and love – interlacing questions of determinism and theology amidst his punch-ups. Yet, even as Hickman hits his narrative stride, he shows that he’s still adjusting to story-telling on comics biggest stage. Both the space battle and the wake of the Nihilo’s action are narrated by a removed speaker, keeping the reader at a distance from the heroes we so desire to get close to. In particular, their humanitarian mission to the victims of the Ex Nihilo comes off as a maudlin waste of pages despite Opena in full gravitas mode. Just a word from Thor’s lips to pair with his actions could have loaned these scenes the narrative heft to match their imagery, but Hickman misses the chance. A final Earth-bound sequence by Weaver is all exposition to get us to the issue’s big reveal. It’s a doozy in terms of Marvel continuity, but it would have been heavier if we could expect a Secret Invasion style “Who could it be?” surprise in the coming issues. Unfortunately, the mystery doesn’t have a very deep bench of characters to draw its answer from. It would have probably been more interesting to make the subject a mutant than an Inhuman, which would have also made the X-Men more relevant to the event. 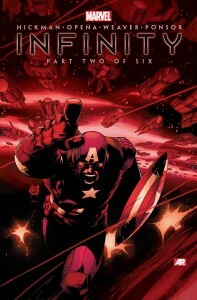 Alas, Marvel has other intellectual property to flog in 2014, and Hickman dutifully steers the story in that direction. We end Infinity #2 in a far more interesting place than we began, questioning the motives of a pair of seemingly-unconnected but equally-complex enemies. It’s clear this crossover isn’t going to be the two-front bash-em-up its lead-up suggested. Yet, one-third of the way through the event, it’s a fair question to ask if Hickman will ever make these stunning images and surprising developments truly visceral. For all the barbs thrown at past event-pilots Bendis and Fraction, they each knew how to give voice to fan favorite characters and twist a personal knife amidst the destruction of battle. Though the story of Infinity has now proven its intrigue, I fear Hickman might stay removed from the action for the duration of this series. Maybe that’s how it should be … maybe that’s how we avoid a disappointing event. Even so, it’s also going to leave each issue slightly unsatisfying as we finish it.